I've found GoPro's own handlebar mounts to be fiddly to fit, and brittle, therefore vulnerable to breaking. The camera hard cases are good and all, but I'm pretty sure you don't want to be doing a tarmac test for your new fancy £200+ GoPro any time soon. The Barfly Bicycle mount is a decent alternative to the GoPro Handlebar/Seatpost Mount. 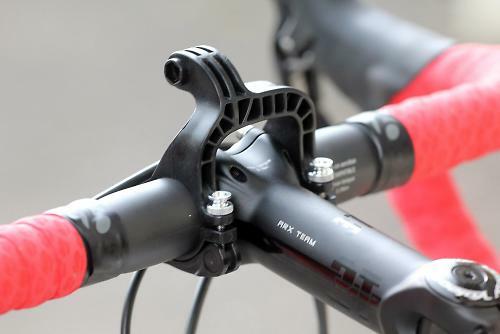 The Barfly mount has a double clamp set up to be positioned on either side of the stem which allows for the camera to be directly in the centre of the bars, rather than off to one side as normal. The quick release clamps are a clever alternative to the normal screw up handles and make for a much cleaner look without it getting in the way of your cabling. It still isn't exactly a slick process to mount it, but the quick release certainly makes it far easier to adjust the mount's position. The standard GoPro handlebar mount somewhat bizarrely needs an extra adaptor to face the camera forwards or backwards. For the Barfly, it is already set up this way, removing the need for extra links that could break, and simplifying the set up. With the range of positions available, it is possible to have the camera facing both up and down while keeping it neatly tucked below the height of the handlebars. If that means your cabling would ruin the picture, you can still have it above the bar and it isn't annoyingly tall. The clamps have a 31.8mm diameter, so you'll need to shim them out for skinnier bars. The flexibility of the plastic damps out the vast majority of bumps on the road, making for much better footage. That flexibility also means the mount tends to bend more with less worry of snapping, even under high force. 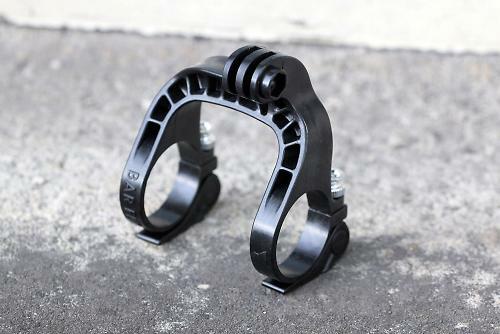 The grip of the quick release clamps is extremely firm and at no point did I have to adjust or tighten them during use. There is no protective padding on the inside of the clamps as on the GoPro mounts, but to my surprise there were no marks on the bars even after a full week. All in all, the Barfly mount is a pretty neat piece of kit. It may be a bit more expensive than both the GoPro handlebar and rollbar mounts, but the benefits are clear to see. Having already bought the expensive camera it must be worth spending a little extra for a better designed and higher quality way to mount it on your bike. The Barfly mount is designed for use with GoPro Hero Cameras. Can be used for both road and off-road bikes, although it was tested on the road. 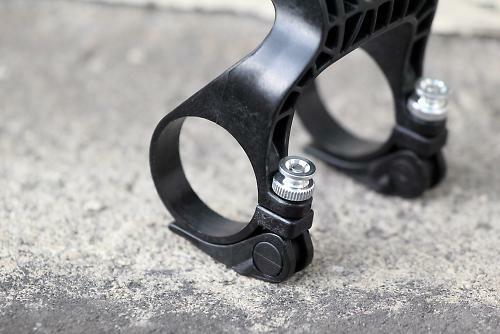 Simple design with two quick release clamps which sit on either side of the stem to centralise the the lens directly in the middle of the handlebars. The clamps have a diameter of 31.8mm. Neat looking product and well made from flexible yet strong plastic. Still a little tricky to set up initially, but the quick release then makes it really easy to adjust position. The flexibility improved video quality and reduced the chances of breaking during use. 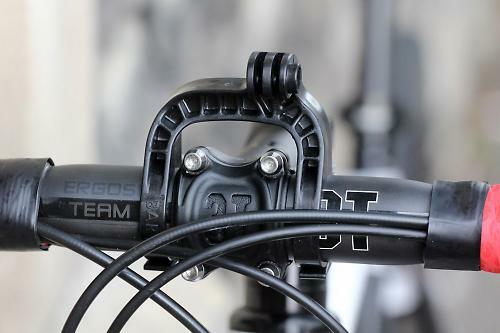 The design also keeps the mount out of the way so you don't have to change your preferred position on the bars. Having been tested for a 3 week period whilst completing JOGLE, there were no faults found with it. The clamps stayed tight without even needing adjusting and at no point was there any worry of the mount breaking. It is a little more expensive than the standard GoPro mounts, but there are enough benefits to make it worth the extra cost. Extremely well with very few faults. The quick release clamps made it really easy to re-position the camera. I'll stick with my K-Edge thanks. Same here! And I got one of mine for about a THIRD of that cost! Come on, 7/10 for value? The tester is only 21 years of age. *Everything* seemed cheap to me when I was that young ... because I didn't have a mortgage and all the other things to pay for that somehow come later. Pity that spanning both sides of the stem would mean I couldn't use my Cateye OTF mount at the same time, particularly odd given it's made by the same people! Making your own products mutually exclusive seems a little daft. A k-edge is in the post. anyone that feels the need to film their rides and torture their family / friends (if they have any) needs a running slap. Well overpriced. Clearly they figure if you've spent £100s on a camera then an extra £50 isn't an issue.